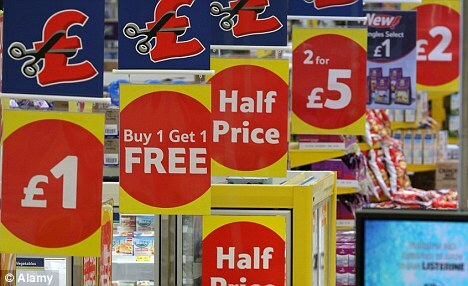 The Tesco ‘price war’ starts and shoppers end up paying more! costs £58.37 – up by £1.34 since the campaign began. move to cut prices across 3,000 shopping-basket essentials. as we can get away with’. checkout than before the price promotion was launched. £2.69, and own-label Parma ham slices were 63p dearer at £2.45. shopping at Sainsbury’s is 79p cheaper than at Tesco. £1.49 less than the previous week. compared with £22.40 at Asda and £23.80 at Morrisons. years as shoppers continue to cut spending. with a fall of 0.1 per cent in the previous quarter.